On behalf of the Board of Directors, it is my privilege to present to you the Annual Report of Oman Arab Bank for the financial year ending December 31, 2017, together with relevant financial statements reflecting the Bank’s results and achievements over the past year. I am pleased to report Oman Arab Bank maintained its strong performance over the course of 2017. This strong result for the Bank was in no small part due to the quality of the Bank’s assets and its carefully crafted business plan, which was endorsed by the Board of Directors earlier in the year. The positive result is also in line with the Bank’s transformative vision to enhance and develop new systems, platforms, and services that will continue to set the benchmark for technological advancement and customer excellence for the foreseeable future. During 2017, the Bank continued to support its partners in the public and private sectors by financing energy, infrastructure, and other large projects in the Sultanate, as well as offering support to small and medium enterprises. On the financial front, the Bank’s net profit increased by 8.24% year-on-year to reach OMR 26.5 million by the end of 2017 compared to OMR 24.5 million reported in 2016. Net Interest Income increased by 12% to reach OMR 56 million. Loans and Advances increased by 4% to reach OMR 1.70 billion, together with a 7% increase in Customer Deposits which reached OMR 1.75 billion. The Bank’s Total Assets increased by 4%, reaching OMR 2.14 billion by the end of 2017. The Capital Adequacy Ratio was 16.11%, well above the regulatory requirement of 13.250%, while the return on equity was 10%. With regards to the financial results of Oman Arab Bank’s Islamic banking Window ‘Al Yusr’, the Bank ended the year 2017 with a net profit of OMR 153,000, a good indicator of the significant growth expected from this window in the near future. 2017 also saw the launch of the digital transformation strategy for the Bank, the launch of the Bank’s comprehensive new digital platforms for Internet and mobile banking, and the reimaging and ongoing modernisation programme for its branch network. These platforms have enjoyed wide acceptance and praise from our valued clients, which has motivated us to continue the implementation of this strategy to cover the entirety of the bank’s operations over the course of the next few years. Indeed, the drive for transformation reinforces Oman Arab Bank’s position as one of the pioneers of digital banking in the local market. Oman Arab Bank believes that its employees are its greatest asset, and in 2017 the bank continued to invest in tomorrow’s talent with ‘LEAD’, a world-class leadership development program. LEAD is firmly centred on developing capabilities and capacities for Omani staff and is focused towards advancing skillsets and capitalizing on greater leadership positions within the Bank. In fact, LEAD 2 program was launched successfully with 20 participants undertaking an intensive six-month training courses in cooperation with an institute specialised in management. Reinforcing the commitment to Omanisation, the bank also recorded a remarkable milestone in terms of citizens employed within the Bank across all levels, achieving a percentage over 96%, making it one of leading Banks in the Sultanate with regards to Omanisation. On the Corporate Social Responsibility front, Oman Arab Bank continued to play its role in joining hands with the local community and supporting a number of non-profit organisations and initiatives. It also took a new approach last year with its community engagement, enhancing the participation of the bank’s employees in general social and community activities. This falls in line with the Bank’s beliefs in the crucial role its staff play in achieving the Bank’s desired social and economic outcomes. Looking ahead, we expect 2018 to be another eventful year where we will continue in our efforts to reaffirm the bank’s position as a leading Omani banking institution, while continuing to elevate our customer banking experience across all touchpoints and platforms. On behalf of the Board of Directors, I would like to take this opportunity to express my sincere gratitude to our customers, partners, and shareholders for their continued trust, which has been the cornerstone of our continued success. I would also like to thank the executive management of the Bank and all employees for their hard work and contributions towards achieving the desired goals of the Bank. 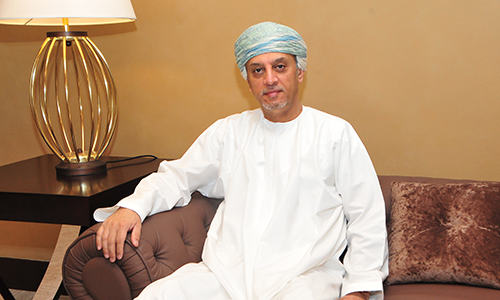 I would like to take this opportunity also to thank the management of the Central Bank of Oman and all government bodies for their continued efforts and support of the banking sector in the Sultanate. Most importantly, we would like to express our sincere gratitude and appreciation to His Majesty Sultan Qaboos bin Said for his wise leadership and vision, which has contributed to the prosperity of our great nation.